The Netflix-like $9.99 per month service is in the testing phase. 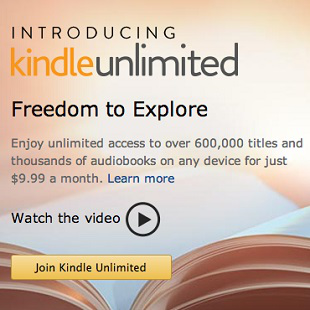 Update: The Kindle Unlimited program is now live, and officially official. You can find the Amazon page here, and there's a 30-day free trial for any interested parties. As previously reported, over 600,000 books are on tap, as are "thousands" of audiobooks. You'll be able to switch between overlapping titles via Whispersync, too. Original Story: Reports are coming in that Amazon is currently testing a new subscription method for its Kindle eBook ecosystem. Kindle Unlimited (Google Cache link) is currently in testing, and it offers participants a never-ending buffet of eBooks for $9.99 per month. At the onset, Kindle Unlimited will offer its users access to over 600,000 titles. None of the "Big Six" English book publishers (Random House, Hachette, Macmillan, Penguin, HarperCollins, and Simon & Schuster) appear to be included in the offer. While Amazon would certainly be the biggest company to offer such a subscription plan, it would not be the first. As Gigaom points out, Oyster and Scribd both offer similar plans, and have inked deals with some of the above-referenced mega publishers. However, it appears as though Amazon will be including several thousands audiobooks with its service, something not offered by the competition. It could be some time before Amazon lines up the bigger book publishers for this kind of service. With its ongoing war against Hachette, this kind of subscription could be filed under "wait and see" for some time.